For all the fear of the Capitals’ scoring and their power play, listen to the words of the immortal Flavor Flav — don’t believe the hype. Sure, the Caps tied Game 1 – a game they went on to win – on the strength of an Alexander Ovechkin power play goal. The much-lauded Capitals power play strikes again! They’re not as good as you think. Yes, Washington led the league, converting 28.6% of opportunities with the man advantage. Yes, they scored 44 power play goals, more than any other team. 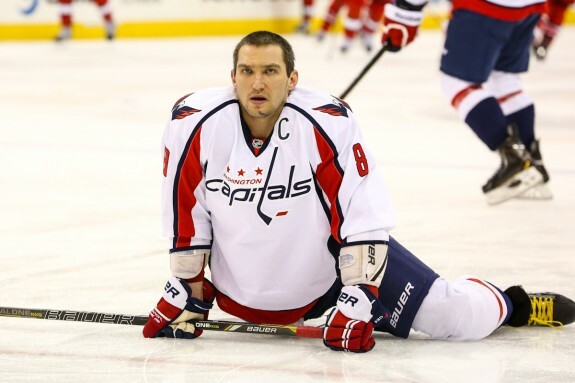 And, yes, Alex Ovechkin led all players with 16 power play goals. But it’s easy to rack up numbers, especially when you do it against weaker teams. That’s exactly what the Capitals and Ovechkin have done. Thanks to the general weakness of the Southeast Division, the Capitals played 56% of their games against non playoff teams – more than any other team in the league. That includes three teams that finished more than ten points outside of a playoff spot: Carolina, Tampa, and Florida. Those three clubs allowed more goals (160, 150, and 174, respectively) than any other teams in the NHL. Talk about quality of competition. Not here. Beating up your little brother doesn’t make you tough. Beating up on your weaker divisional rivals also doesn’t make you the most offensively talented team in the league. The Caps are good, but they’re not nearly as good as their stats would lead you to believe. As for their top-ranked 28.6% power play, let’s break it down. A total of 29 of their 44 power play goals came against non playoff teams. In those games, the Caps converted like crazy with a 29.9% power play. They averaged a difference-making 1.07 power play goals per game. Impressive. Less impressive was their 22.4% power play against playoff teams. Still a top power play, you say? Back out the three games they played against the Toronto Maple Leafs, in which they went 5-for-12. Against the remaining six Eastern Conference playoff teams, the Caps were a very pedestrian 18.2% with only 10 power play goals – dropping them all the way to an average of 0.56 power play goals per game. Better than the Rangers’ power play, for sure, but impressive? Not so much. Let him dazzle you with his amazing moves on the ice! Hang on to your hat as he scores 32 goals on the way to another Rocket Richard Trophy! Be amazed when you realize that he’s only scored nine of those goals against playoff teams! Nine. That’s it. Those other 23 goals all came against teams with losing records. Pretty easy when you’re busy piling up points against a group of goaltenders who combined for a 2.88 goals against average and .901 save percentage. The Washington Capitals are a formidable opponent. They’ll be tough to win a series against, and the winner will have fought hard to claim the series. For the Rangers, that means even more work digging out of a one game series deficit. The Caps’ power play going 1-for-5 in the first game is no surprise – when you give teams five opportunities, they will convert. The Rangers need to stay out of the box more and let the Caps’ man advantage come back down to earth. It will. When it comes to Washington’s power play and gaudy offensive stats, though, don’t – don’t – don’t believe the hype.